Peal Mackie grew up in Brixton in south London. She earned a degree in Drama from the University of Bristol. She speaks three languages: English, French and Spanish. During her studies she went to workshops and took part in many extra-curricular plays. Alongside Martin Freeman, Maxine Peake, Morwenna Banks and Matt Berry, Mackie appeared as a front of house girl in the 2013 music comedy Svengali. In 2014, Mackie played Anne-Marie Frasier in Doctors and the young computer genius Mia in Crystal Springs at the Park Theatre in London. [ She has also been seen in the political satire Obama-ology at the Finborough Theatre, the National Theatre's West End production of The Curious Incident of the Dog in the Night Time, and the short film Date Aid by Bond. Pearl has worked as an acting tutor for Troupers, a company that teaches theatre skills to children and young people. Pearl was brought to our screens in 2017 as Bill Potts, companion to the Twelfth Doctor. She blew audiences away with her portrayal of Bill, who brought never before seen queer representation to Doctor Who. She is the last companion to the Doctor who has appeared on screen to date, with her last appearance being the 2017 Christmas Special, Twice Upon A Time. 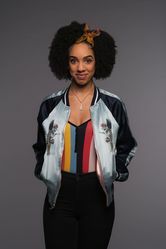 You can follow Pearl on Twitter at @Pearlie_mack and Instagram at @therealpearlmackie.